Democrats are understandably excited about the possibility that their more-likely-than-not conquest of the U.S. House on November 6 could be joined by a less-likely-but-feasible takeover of the Senate as well. It’s an important subtext of the fight over Brett Kavanaugh, if not (as Lindsey Graham claims) the main motive of Democratic efforts to delay his confirmation until the midterms. And a Democratic Senate could certainly curtail Donald Trump’s power significantly during the remainder of his term, if only by slowing down Mitch McConnell’s freight train of executive and judicial confirmations. If Democrats control Congress entirely, Republicans can forget about another run at repealing Obamacare or cutting taxes, and will be dealing instead with multiple investigations of Trump-administration corruption and worse. Initially, the idea of a Democratic Senate takeover in 2018 seemed absurd, thanks to one of the most heavily skewed landscapes in living memory. Twenty-five of the 35 seats up this year (including special elections in Minnesota and Mississippi) are held by Democrats, and 10 of them are in states carried by Trump in 2016 (only one Republican, Nevada’s Dean Heller, is running for reelection in a state carried by Clinton). The path to a Democratic Senate was first made manifest by Doug Jones’s shocking special-election victory in Alabama last year, which reduced the magic number for Democrats to a net gain of two seats (a 50-50 Senate would be controlled by Republicans thanks to the vice-president’s tie-breaking vote). At this point, FiveThirtyEight shows every single Democratic incumbent senator leading. Republican seats in Arizona, Nevada, Tennessee, and Texas are all vulnerable. Two of those four would do the trick if Democrats sweep their own races. But suddenly there’s a Democratic seat in jeopardy that hasn’t drawn much attention until now, and it’s in a deep-blue state, New Jersey. A new survey of likely voters from Stockton University (a well-reputed pollster) showed two-term incumbent Bob Menendez in a virtual dead heat with Republican challenger Bob Hugin (the incumbent leads by 1.8 percent, but the margin of error for the poll is 4 percent). This is one of several polls showing Menendez with a less than overwhelming lead. The incumbent was the subject of a much-publicized corruption trial, in which ophthalmologist Salomon Melgen, who was accused of making large campaign contributions and providing extensive perks in exchange for help from Menendez in a Medicare-fraud case. The case against Melgen and Menendez ended in a hung jury last year. After an adverse ruling from the judge in the case, the Justice Department decided not to pursue a new trial for Menendez, who got out of the whole scandal with just an Ethics Committee reprimand and an order to repay certain gifts from Melgen, plus some severely depressed approval ratings in New Jersey (he was underwater at 33/41 in a Morning Consult poll in July). While there was some nervousness among Democrats about Menendez’s reelection prospects, his popularity ratings bounced back after the case was dismissed. And the state’s partisan character (no Republican has won a Senate race in New Jersey since 1972) was expected to pull him through, as it may yet. It’s also likely that national and state Democrats were loath to back a primary challenge to a senior Hispanic elected official (Menendez was chairman of the House Democratic Caucus before his election to the Senate) who has aggressively defended himself against the corruption allegations. Menendez was unlucky, however, to draw a Republican opponent with pockets as deep as those of Hugin, a former pharmaceutical executive. One other thing to keep in mind about Menendez and NJ-SEN: Outside of Florida, it's really the only race in the country where the Dem candidate is getting way outspent over the airwaves. Hugin supported and donated heavily to President Donald Trump’s 2016 election effort and headed a New Jersey–based pharmaceutical company that raised prices 20 percent in less than a year on a key cancer drug, parked money overseas and made it harder for companies to produce a generic version of its drugs. In that Stockton poll showing a close race, half of voters expressed concern about Hugin’s conduct as an executive, nearly as many as the 59 percent who seemed concerned about the corruption allegations against Menendez. 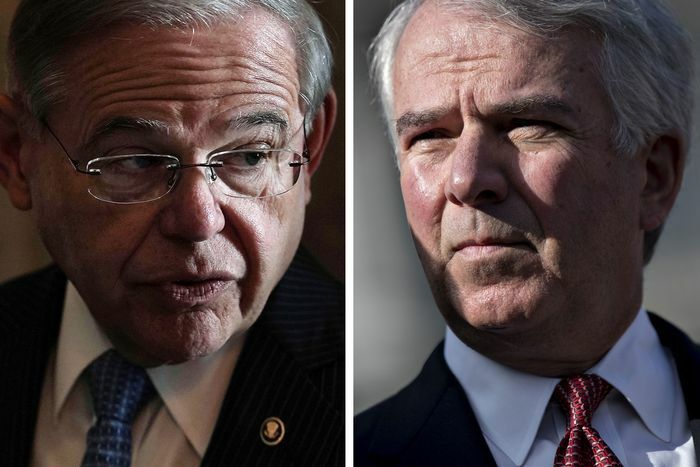 Perhaps disdain toward Hugin or sheer partisanship will save Menendez. But it would be a cruel irony if Democrats managed to win Senate races in places like North Dakota, Tennessee, Texas, or West Virginia and handed the gavel right back to Mitch McConnell by stumbling in New Jersey.